Ya Jagoff!!! | It's Starbucks, Not Heinz Field!!! Home Starbucks Jagoffs It’s Starbucks, Not Heinz Field!!! It’s Starbucks, Not Heinz Field!!! So Starbucks is a great place to hang out, relax, meet some business people and work on writing posts for this blog. EXCEPT IF THIS GIRL IS IN THERE!!!!! Anyway, the two girls in the photo above come in and sit down. It’s some kind of “get-aquainted-you-tell-me-about-you-and-I’ll-tell-you-about-me” conversation. 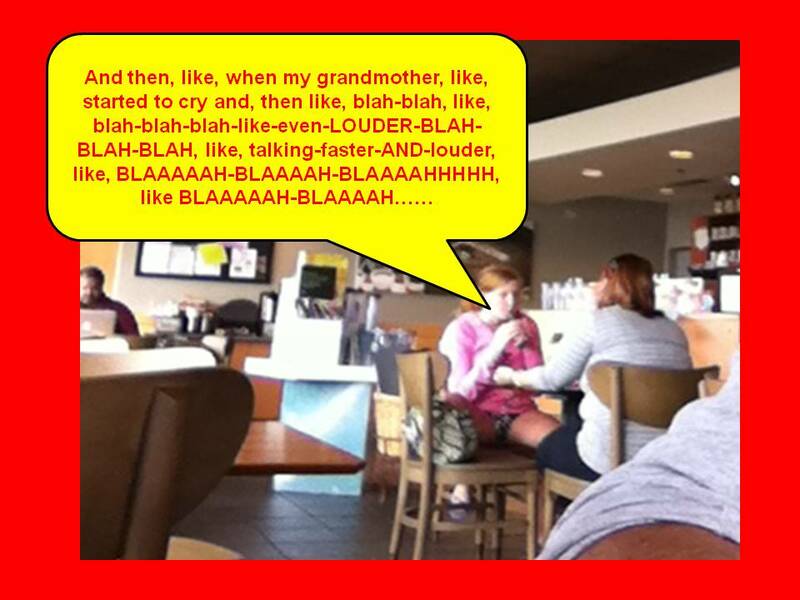 I know this NOT from eavesdropping – the girl in the red hair talked sooooooooooooooo loud that I could hear her talking even when the cappuccino machine was running. On top of that, she talked so fast and sooooooooo much that my head thought it was on the Scrambler ride at Kennywood Park. The other girl was so politely quiet as one SHOULD BE in a public place, that, at first, I thought the red-head was one of those people that over-modulates on their cell phone as they are walking through town or sitting on the bus. Not sure if the recording helps you feel my pain but, consider this, the recording was made in my iPhone from about 20 feet away. Hey Missy Megaphone, meeting at a Starbucks is certainly no library meeting, but the next time you have one of your “You-sit-still-and-I’ll-tell-you-about-me” meetings in a public place, how about taking a heavy dose of “Shut-the-hell-up!” pills. Or, feel free to have your next life-crisis conversations at Heinz Field while the Baltimore Ravens are trying execute a no-huddle offense in the final two-minutes of the game. We’re pretty sure THAT CROWD will be louder than you (at least we THINK so) and nobody else within 3 feet will have to give a @#$@ about what you’re saying, Ya Jagoff!! How NOT To Make Your Point! Parking Jagoffs From Perth to Pittsburgh!